Yes, it is highly possible that blogging about a blog could somehow form a vortex between dimensions or even create a black hole like the Large Hadron Collider. 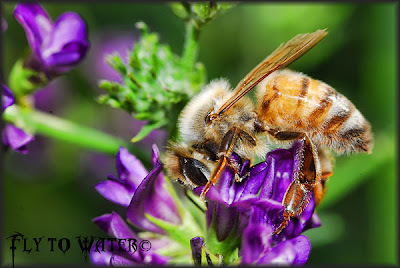 Nevertheless UtahBeeKeeper risked it all and was very complimentary in his post about Fly to Water. I also discovered his operation Millcreek Valley Farm, which produces a variety of high quality soaps, lotions, bath salts, and other hand-made products. Check out his web page at Millcreek Valley Farm. Who knows where it will all end, now that I have blogged about a blog about a blog. Thanks UtahBeeKeeper! Thats a beautiful macro ... Shot! :::: chuckles ::::: This line of reasoning must involve the space time continuim that Doc was so concerned in Back To The Future. Excellent shot of the Italian Honey Bee. Did ya have to cammo up to get it?